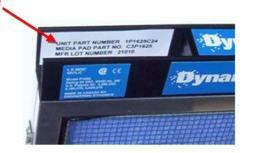 AirRanger replacement filter pads for your AirRanger air cleaners. Quantity discounts on Air Ranger replacement filter pads. Air Ranger air cleaners are manufactured by Dynamic AQS. Here is the Dynamic air cleaner owners manual. All Electro Breeze air cleaner pads are made from verified materials tested and designed especially for polarized media air cleaners including the Air Ranger air cleaners. The original Clean Air Defense Air Ranger filter pad may have a target painted on it. Since the manufacturer chose to use a cheaper Carbonized mesh rather than a full sheet of carbon, like the Electro Breeze brand, they had to add a piece of foil as a target so the electrode would touch the foil and electrify the pad. No worry with the Electro Breeze brand replacement pads, you can load them any which way they fit and you will be sure to have a secure contact with the carbon sheet for optimal distribution of the electrical current. Panel size is labeled on black track of your panel (example 3LPG1625C24). Please order your pads using this panel size. Air Ranger air cleaner. Click here to see our comparisons.